Watch a "Baking tips with Abi" video clip showing you how to ice the cinnamon cookies from the Children's Christmas Baking Kit. 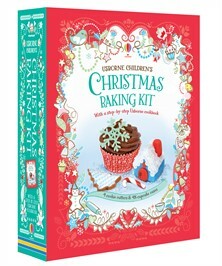 For Abi's baking tip on how to use an icing gun, search Quicklinks for the Children's Cake Decorating Kit. A delightful baking kit to make delicious festive treats, from gingerbread houses to sparkly stars, presented in a gorgeous storage box. Includes a baking book with more than 20 delicious recipes, 4 festive cookie cutters in star and Christmas tree shapes and 48 colourful cupcake cases. Every recipe has simple, step-by-step instructions, illustrations of the key steps, photographs of the finished product and tips for adapting to suit taste or allergies. Alongside favourites such as mince pies and ginger bread are more unusual treats... On your marks, get set, bake!